FRAME OF MIND: "Getting to where I am is something to be proud of." 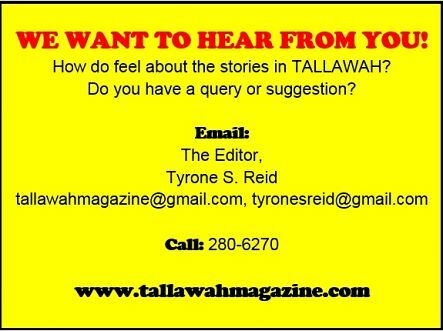 TALLAWAH: Why do you take such a boldly unorthodox stance on relationships? What accounts for that? Stephens: Well, I’m just being realistic. I’m not a hypocrite. I don’t lie ’bout nothing. I’ve always been this person, but what I’ve changed is how I display myself to other people. There was a time when I would just sit down in the corner and not say anything because I didn’t want to upset anybody’s apple-cart, and I didn’t want to start too many arguments. But now I don’t really care what anybody thinks. The older I get is the less I care about what other people think. And that honesty comes out so powerfully in your lyrics. In what way(s) have you seen your songwriting evolve over the course of your career? As I grow, so does everything in my life, and I’m not one of those artistes who put on a different face to go on stage. It’s just one person in here. She’s the one who writes, she’s the one who performs, she’s the one who is a spouse, she’s the one who is on the street going to the market and meeting people. There’s only one me. So when this person grows, it reflects on everything I do. You have a new album called Guilty coming out soon. Why that title? Because I get accused so much, so I’m just like f—k it, ‘I’m guilty!’ [The album] will be out next year. I was aiming for this year, but I didn’t hit the mark. I’m finished with the album though; it’s just the behind-the-scenes discussions that’s dragging out longer than expected. But it definitely ah come out. You turn 40 next year! How do you feel about such an incredibly personal milestone? I’m not no regular 40 (Laughs). I feel proud, coming from where I’m coming from. And getting to where I am, that’s definitely something to be proud of. I am very happy. I am the mother of an 18-year-old, so next year when I turn 40, she turns 19. I had no idea you had such a big daughter. Yeah, mi have one big pickney, and for me, I think that is something to celebrate. So music and family aside, what always makes you happy? Seeing people come into themselves and feel comfortable in their own skin, and expressing it. So obviously I don’t get that all the time because so often people are forced to compromise themselves and that bothers me. But hanging out with people, having a drink, getting sloshed (Laughs). All of that makes me happy. I love Tanya Stephens. She is just herself, open and honest. I also like the way she tackles "hot topics" in a down to earth and realistic way. I agree with her too... once you reach a certain age you don't care what people think, any more! Why should you? Good for her!